At an event where the emotions were as mixed as the weather, Chabad House at Rutgers University ceremonially broke ground on a $10 million expansion named in honor of a slain Chabad rabbi and his wife. Chabad House chair Danny Kahane addresses the crowd at the ceremonial ground breaking for the 55,000-square-foot addition to Rutgers Chabad as director Rabbi Yosef Carlebach looks on. The 55,000-square-foot expansion is dedicated to Rabbi Gavriel and Rivkah Holtzberg, killed in a Nov. 26 terrorist attack on the Chabad Jewish center in Mumbai, India. Construction will add dining facilities and a 72-bed boys’ dormitory and create the first Sephardi synagogue on a public college campus in the nation. On Dec. 21, hours before the start of Hanukka, guests arriving in a cold rain gathered in a heated tent for the ceremonial ground breaking. Just moments before Rutgers Chabad director Yosef Carlebach began the ceremony, however, the sun broke through. Guests included two leaders from the Federation of Indian Associations, an umbrella organization representing about 300,000 Asian Indians in New York, New Jersey, and Connecticut. The federation’s incoming president, Dipak Patel, and its fund-raising committee chair, Anand Patel, presented Carlebach with a check to signify the friendship between the Indian and Jewish communities. Carlebach recalled standing on the same spot 14 years earlier as work was to begin on the 35,000-square-foot Les Turchin Chabad House. The facility opened in 1996 with kosher dining facilities and a 37-bed girls’ dormitory. “Today we are starting a new era of campus life,” said Carlebach. 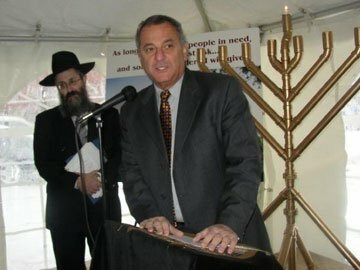 He predicted the additions would “literally change the lives” of Jewish students on campuses across the country. 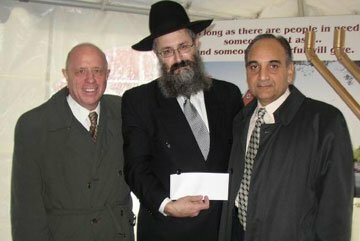 Rutgers Chabad director Rabbi Yosef Carlebach, center, accepts a gift from Dipak Patel, right, incoming president of the Federation of Indian Associations, during the ground-breaking ceremony for the addition to the Chabad House at Rutgers; with them is Chabad board member Gerry Marks. The expansion will also include new lounges, a coffeehouse, an art studio, a soundproof music room, new kitchen facilities, a multipurpose room, and male and female exercise rooms. Carlebach said actual ground breaking would begin in several weeks, weather permitting, and completion is expected in about 18 months. To make way for the expansion, Chabad struck a deal with the university in which Rutgers turned over contiguous property on Senior Street just behind Chabad House on College Avenue in New Brunswick. Under the agreement, Chabad purchased a piece of property on College Avenue that the university couldn’t buy and “swapped” it for three houses used by the campus ROTC and Air Force for recruitment and meetings. The military moved to other sites on campus. “It is an honor to take part in this addition…that will make Chabad even more welcoming and useful to our Rutgers students,” said McCormick. Donald Epstein, a member of the building campaign committee, acknowledged the difficulties in finishing such a large-scale project in the current economic climate. The terrorist attack that took the lives of the Holtzbergs lent a somber cast to the ceremony. Chabad House chair Danny Kahane said despite the tragedy, the Jewish people needed to move forward, performing good deeds and undertaking such projects such as the expansion. 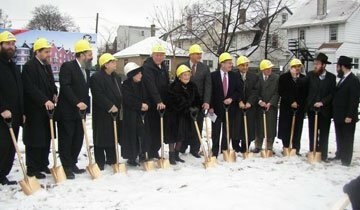 Lay and professional leaders of Chabad joined Rutgers University president Richard McCormick and representatives of the Indian community for a Dec. 21 ceremonial ground breaking for an addition to Rutgers’ Chabad House. Dipak Patel told the gathering that the Indian and Jewish communities have much in common, especially after the Mumbai incident. Dipak noted the same terrorists who targeted British and Americans for being members of “peace-loving” nations also “brutally murdered” the Holtzbergs. “My heart goes out to this community,” said Dipak. To View Photo Gallery from the event click here.